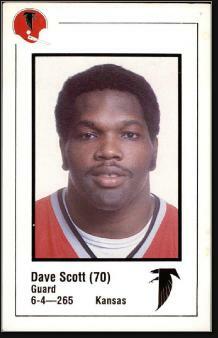 Arthur David Scott was born December 26, 1953 in Hackensack and grew up in Paterson. Big and agile, he grew to 6-4 and starred on the line for Paterson High School. In 1972, Dave accepted a scholarship to Kansas, where he played tackle under head coaches Dan Fambrough and Bud Moore. The Jayhawks played in bowl games his freshman and junior seasons, losing both times. Dave’s greatest game came against the Oklahoma Sooners, who would go on to win the national title that year. Kansas played an epic ball-control game, running on every play. The Jayhawks turned a 7–3 halftime lead into a 23–3 victory thanks to 8 second-half take-aways. The Atlanta Falcons selected Dave in the third round of the 1976. His Welcome to the NFL moment came in preseason practice against fellow Falcon Claude Humphrey. He tried to chop block the veteran defensive end and the next thing he remembered was peeling himself off the turf. Dave moved into the starting lineup as a guard in 1977, teaming with Jeff Van Note, Mike Kenn, Warren Bryant and RC Thielemann. Their offensive line was a key to the success of quarterback Steve Bartkowski, and, later, 1,000-yard rusher William Andrews. The Falcons made the playoffs for the first time in 1978. They defeated the Eagles in the Wild Card Game before falling to the Cowboys. In Dave’s final season as a starter, 1980, the Falcons reeled off 9 straight wins and won the NFL West title for the first time with a 12–4 record. Unfortunately, they lost to the Cowboys in the playoffs again. Dave retired after the 1981 season and went into business. He continues to live in the Atlanta area.